Hi warren, unfortunetely that does look to be another classic Indian special- all the usual hallmarks are there like you say. There's also Lingham Brothers, Lingham Bros, Bolts & Bars escutcheon variations as well. You've probably noticed when you look at any suspect plates -not just the copies supposedly of the safe makers but machinery, breweries, nautical, ships builders etc- the ones that they typically copy, they nearly always follow a similar pattern and have similar characteristics -they cast two or three versions of each with name variations, often with and without an address etc, and some in brass and others in iron. I've seen copies of maritime plates where almost every letter has something wrong with it- either misaligned, wrong font or actually a different size! There is never a guaranteed answer but I would think that your Lingham is genuine. These were not being made by Hobbs or Chubb and for economic reasons, they may well not have scrapped it for a small error especially when they were not the most perfectly designed plaque even when they had had a good day at the foundry- which makes it way more difficult when spotting errors in order to judge its authenticity. The copies I have seen have generally not been made up from scratch, but are a direct copy of a plaque that they have borrowed. Here is my plate and I think the background pattern is difficult for the Indians to successfully copy. The rear is not exactly as mine but still on average I think yours is genuien (until another few end up on ebay next week). 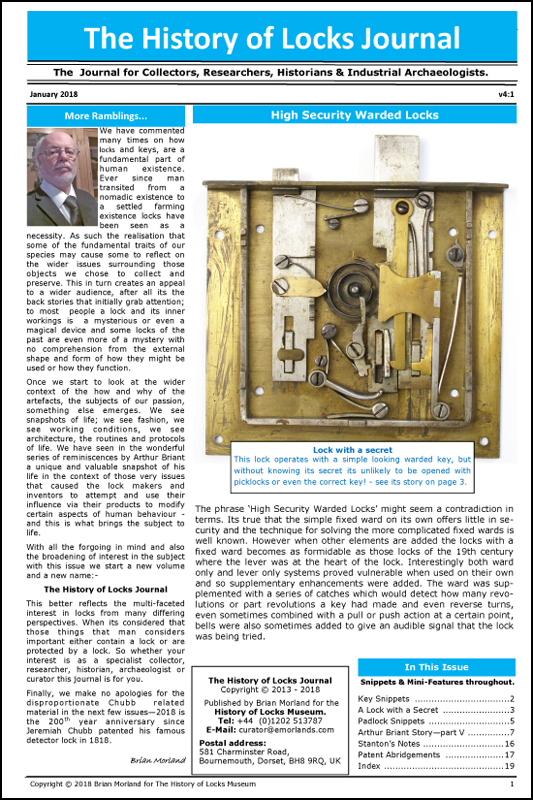 I think the Guard safe was never a quality production anyway and came from an insignificant backstreet safe manufacturer, but there is never any guarantee. Hi and thanks for your input once again guys. I'm going to have to sit on the fence on this one. I'll keep an eye on eBay and see if any more of these plaques turn up. Along with my original observations I can agree with both opinions you guys have offered. I have only ever seen this one plaque turn up on eBay (in six years of looking!) which is a plus I suppose! Several of the observations I made in my original post are contradicted when I look at your plaque Tom and if I go with your opinion I don't feel robbed of my £30 so that's a positive. It's a real bummer that as collectors we have to doubt the authenticity of these sought after items. I have built up a collection of several hundred safe plaques, keys, handles and escutcheons. Among these I have one definite copy and even the thought that there could possibly be others annoys me. Thanks once again chaps for your expertise and valuable opinions....Respect. Just found this safe online and pretty much confirms the existence of the Lingham safe plaque so thought I would add to and refresh. All is well ! That style of safe could pass with any one of dozens of different names on it. Even Cartwight's and S. Withers' bottom of the range offerings looked pretty much the same, hinges, handles etc. You'll see those shield escutcheons plain, also marked Patent, Invoiable Lock etc. Only kidding though I'm sure Tom's comments above are correct and it is an example of one, albeit an obscure name from the very bottom end of the market. I did actually think that there was a slight chance that it could’ve been possibly added at a later date Huw ,so your wind up didn’t surprise me too much. As I’m in a good mood I’ll settle for my glass being half full this time though mate. There was a company called Safes Ltd. of Barton Street, West Bromwich, which, in 1968 was part of the S. Withers company when it was acquired by the Stratford Safe Co. Withers also had the names of J.Cartwright, Thos.Perry, E.Hipkins, Phillips and Birmingham Safe Company the last of the 40 or so makers in the Midlands. I seem to remember that Stratford produced a very cheap version of the Standfast with a 1/4" door plate for the Middle East market which was plainly badged in chrome 'SAFES LTD'. nice one safeman, I had a good chuckle at that!